One of the easiest ways to dig deeper into God’s Word is to follow along with what is being taught at your church, either from the pulpit (if your pastor preaches/teaches through a book of the Bible in an expository fashion) or by means of an adult Sunday school class where you are part of a group that together explores a book of the Bible guided by a knowledgeable and (hopefully) gifted teacher. As an example, at my church we are currently going through the Old Testament book of Nehemiah on Sunday mornings. What I do as part of my study time on Thursday or Friday is read through the section (usually an entire chapter) that will be taught that coming Sunday and then try to get a better big picture understanding of the text with the help of a concise commentary. (A good one-volume commentary gives me a “sneak peek” at a section of Scripture in preparation for more in-depth teaching or study.) Come Sunday morning, I already have a “Nehemiah mindset” with a foundational grasp of the text being covered, so I can listen more closely for new insight and understanding to apply to my life. To drive the teaching home, I will then spend some of my study time on Monday or Tuesday going through a more detailed commentary and/or completing a section of a study guide from my Bible software on the material covered the Sunday before. Of course, later in the week, I start this simple, but effective three-step study process over again on the next section of Scripture. 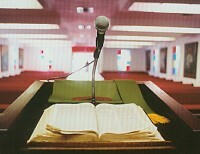 If you are serious about God, His Word and His Son, in addition to spending time studying the Bible on your own, I strongly encourage you to make it a priority to get to a solid Bible teaching church regularly for the weekly weekend teaching/worship service, as well as during the week as opportunities to learn and serve present themselves. You will be amazed at the impact it has on your spiritual growth. While most of us always welcome the opportunity to make new friends, when it comes to friendship in general, what people want (and need) most is a few close friends that they can tell anything and they know they will still be loved and accepted. Someone who will be there for them during the valley times of hardship and heartache. Someone who will laugh with them, cry with them and enjoy every bit of this journey of life on earth with them. Sadly, too few people today actually experience “true” friendships with any depth and significance to them. They have difficulty finding those type of friends and, just as challenging, many have trouble finding the time and energy to be that type of friend to others. Add to this equation dysfunctional families where brother/sisters, parents/kids and husband/wife struggle to just be friends, compounded by the watering-down of the definition of “friend” by social network sites like Facebook, (seriously, you have 1,500 friends? ), and the reason many of us are experiencing a “friend crisis” becomes more obvious, if not the solution. 1) Proverbs 13:20 – What kind of friends should we choose? Why is this important? 4) Proverbs 15:15b – What do you need to do (i.e. changes in outlooks, attitudes, actions) to make yourself more consistently cheerful? How will that encourage others? 5) Proverbs 27:2 – Are you better at singing your own praises or praising the work of others? Identify a friend who deserves some recognition/affirmation this week and do it. Challenge: Before the day is out, call (don’t email or text… call!) one friend that you want to be closer to and become a much better, truer friend in light of the Proverbs studied. Tell them briefly about what you learned and set a time to just get together to start building a stronger, healthier, more enduring friendship. Of the five Bible software programs I own, none provides the variety of powerful built-in tools for equipping a layperson like myself (and maybe you) for serious Bible study like the one from Logos. While most of their nine library packages seem primarily geared for pastors or pastors-to-be (Bible college or seminary students) and many of their add-on resources are of a “scholarly” nature, the meat-and-potatoes functionality of their core software will allow anyone to easily dig into the Bible with greater understanding, even from the original Greek and Hebrew texts, than they ever thought possible. After having spent years developing and improving the PC (Windows) version of the core software engine and interface, Logos introduced a totally rebuilt version of their software (version 4) for both Windows and Mac in late 2009. After that came an iPhone/iPod version, then one for iPad, and most recently a version for devices running the Android operating system, (which is my portable OS of choice). If you have Logos on multiple devices, the resources will actually sync-up, meaning that you can exit a specific resource on your computer at home and then pick up right where you left off on a mobile device while waiting for a prescription to be filled, for example. You can even access most of your resources (some are restricted due to licensing agreements) from any computer with an Internet connection by going to Logos’ Biblia.com web site. With all those options, I still, personally, prefer to do a bulk of my Bible study using Logos on my laptop, (mainly because many of the study tools on the other platforms are somewhat limited or missing completely), but greatly appreciate the freedom and flexibility of having access to my library of Bibles and books pretty much any time, any where. When Logos first introduced the significantly improved Version 4.0 of their software almost two years ago, it was missing some basic features, such as the ability to print any of your resources. While this type of omission was frustrating for many, it was never really a concern for most users, as they knew from experience that the folks at Logos always seem to be in development mode, adding new features and improving functionality. In fact, in the 21 months since Logos first introduced Version 4.0, there have been two major updates, (i.e. 4.0 to 4.1), with a third (v.4.3) about to go “gold” any day now. In addition to these more significant releases, Logos has issued seven incremental updates, (i.e. 4.0a to 4.0b), consisting mostly of smaller, but still welcome bug fixes and minor enhancements. Best of all, Logos doesn’t charge the user for any of these updates, unlike most other Bible software companies that seem to release a “new and improved” version almost yearly for a discounted, but still significant (at least for my wallet) upgrade charge. Obviously, there is the complete text of the Bible, but not in multiple popular translations like you might find on other major “Bible” sites. No, Bible.org offers only one translation: the NET Bible. I won’t go into too much detail about or comment on this translation other than to say the verse footnotes are extensive and that it has been endorsed by well-known Christian pastors such as Chuck Swindoll, Tony Evans, Howard Hendricks and more. While it is copyrighted, it is available as a free download. The people at Bible.org have also worked hard to build an online “study environment” that makes using the NET Bible for personal study as easy and effective as possible. I encourage you, while you are at Bible.org, to give it a try. One of the biggest benefits of the Bible.org study materials is also one of it’s biggest challenges: There is a LOT of it by many different authors. Trying to find the ones that meet your needs and are written in the style/format that you like can be extremely time consuming. What has worked well for me and what I recommend to others (you) is that you start with the verse search. Enter a passage in the space provided, hit “enter” and you will be presented with a list of studies that relate to your passage, sorted by “relevance.” Examine the different results and note the authors that you like. Then go to “studies by topic” and pick a topic of interest from the list. Again, read the different studies listed, making note of the names of the authors that present the material in a way you benefit from and enjoy. Later, whether you search by author or simply note the names of your favorites in other search results, you will spend more time actually using the studies then searching for them. While many of the “studies” on the Bible.org web site could be better classified as “study articles,” similar to a user-friendly commentary, there are those authors who do incorporate individual and/or group study questions, as appropriate. The other aspects of Bible.org, and there are many, are what make it difficult to succinctly or even accurately describe everything you will find or can do on the site. There are different study communities for men, women, pastors, people in children’s ministry, etc. There is also an area where you can read fresh Bible-related blog postings by any one of about two dozen bloggers that are associated with Bible.org, as well as visit Bible.org’s Forums section for online discussion about a variety of topics, including Bible.org. While not really relevant to the topic of “better, easier Bible study,” there is also a “Users” and a “Labs” section for you to get involved with what the people behind Bible.org are trying to accomplish, if you choose, as well as a store where you can purchase physical (as opposed to online) NET Bible-related items. If you go to their About Us page and do some other looking around the web site, it will be pretty clear pretty quick that Bible.org is a ministry with a solid Bible-based mission that also relies, at least in part, on voluntary donations by people that use and appreciate the work that went into making all the resources available to change lives and glorify God. If you feel so led, I encourage you to encourage them with a donation. READ THE TEXT completely through once. 1. Why do you think some people are more open to spiritual matters than others? 2. The seed is the message of the kingdom (v. 19). Who is the farmer, and who is the soil? 8. What are some of the practical things we can do to keep our hearts good, fertile soil? 9. What are some weeds that tend to limit the effectiveness/impact of a Christian’s life? 10. How can you avoid this in your own life and encourage other believers to do likewise? THANK GOD for sowing the seed in your heart. PRAY that the message about the kingdom would take deeper root in your life and bear much more fruit that glorifies God. CLOSING THOUGHT: Regarding your answer to question #7, as difficult as it is to admit, if your life (words, actions, attitudes) is not regularly making a noticeable, eternal difference for God’s kingdom in the lives of others, then you probably fall into one of the first three categories of soils Jesus described. If so, do something about it today! You’ll be glad you did. The Opening Up Commentary Collection offers accessible and easy-to-read introductions to the books of the Bible. The commentaries tackle the key issues in each book by introducing the history and context and by giving an overview of important themes and events. The authors wrestle with the hard questions and navigate through the difficult issues, with a keen eye toward application and relevance for today. Each commentary starts out with a very helpful “Background and Summary” chapter. Commentary is provided on paragraphs and sections of Scripture, to expound on both the overall thought of the writer and specific details of his message. While this commentary series would prove to be a very good addition to anyone’s library, it would be an excellent and highly recommended resource for someone reading one of the books of the Bible start-to-finish for the very first time. If you haven’t read the book of Acts before (or if you read it and didn’t feel that you got a lot out of it spiritually), I encourage you to get Opening Up Acts to help you gain greater insight, as well as to experience the benefits of this commentary series. A 30-volume collection and individual commentaries are available in electronic format for Logos Bible Software. Pentecost means ‘fiftieth’ and was celebrated on the fiftieth day after the Passover (Lev. 23:15–22). Pentecost is another name for the Feast of Weeks (Exod. 34:22–23) or the Feast of Harvest (Exod. 23:16). The great national feasts of Israel have great significance in the New Testament. The Passover involved the killing of the Passover lamb and was ultimately fulfilled in the death of Jesus Christ (1 Cor. 5:7). Similarly, the coming of the Holy Spirit is the fulfilment of the Feast of Pentecost, a pledge securing the believer’s living hope (2 Cor. 5:5; Eph. 1:13–14). In accordance with God’s timing, the Spirit came suddenly, accompanied by supernatural sights, sounds, and speech, described as being like a violent wind and fire (vv. 2–3). Words fail to capture the exact phenomena experienced by the disciples, yet the description clearly attests to their supernatural origin. Wind and fire are used in the Bible as pictures of God’s presence and the Holy Spirit (Gen. 15:17; John 3:8). The fire rested on each one of them in that place and they were all filled with the Holy Spirit and began to speak with other tongues. Being ‘filled with the Holy Spirit’ (v. 4) is something that should be continual in the life of a believer. We are commanded to ‘be filled with the Spirit’ (Eph. 5:18), which is accomplished through letting ‘the word of Christ richly dwell within you’ (Col. 3:16). We are filled with the Spirit when we have a mind saturated with the truth of God’s Word (see John 17:17). Stephen was full of the Holy Spirit, as demonstrated by the way he boldly proclaimed Christ, even to the point of death (Acts 6:5; 7:55). The ‘tongues’ spoken (2:4) were foreign languages, previously unlearned by the speakers, and were clearly understood by the foreign Jews who knew those languages. The population of Jerusalem swelled at Pentecost. During Israel’s national feasts, ‘devout men from every nation’ (v. 5) would make the pilgrimage all the way to Jerusalem in order to participate and worship. Over 200,000 people could assemble around the temple area alone. Many foreign Jews also moved to the region of Judea in their old age so that they could die in the Promised Land. The visitors to Jerusalem were astonished to hear unlearned, unsophisticated Galilean Jews speaking their own home languages from the Middle East, Asia Minor, Europe, and North Africa. This was surely a supernatural event, one which left them wondering about its meaning (v. 12). Some in the crowd began to mock, dismissing the foreign languages they could not understand as drunken babble (v. 13). (Example Source: John-Michael Wong, Opening Up Acts, Leominster: Day One Publications, 2010). As I mentioned in a previous post, while I own five different Bible software programs, I really utilize only two of them on a regular basis: WORDsearch Bible Software and Logos Bible Software. Both are very good, solid programs and there are a fair number of similarities that make either one a great study tool for personal spiritual growth. As would be expected, each also has its own strengths and weaknesses, especially when compared to each other. However, I find them to be quite complimentary, as well, when used in tandem for personal Bible study. Next week we’ll look at Logos Bible Software, but I thought it appropriate to start with the first Bible software program I ever purchased and still rely on heavily today. I really like having one click access to my entire library of resources, sorted by category (my default selection), title or author. The expandable menu tree, which resides on the left side of the desktop, can be set to auto-hide or be anchored open and is great for easily accessing your library of books. You can create your own categories and subcategories and reassign resources to your liking, but I find the default category chosen by the people at WORDsearch pretty right on most of the time. You can also access your list of “favorite” resources and any verse lists you’ve created in just one click. Finally, the ability to filter your search for a book in the resource bar by typing the first few letters of the title or author’s name is a very nice touch. I am one of those people who often likes to see what the resources in my library have to say on a certain subject and WORDsearch’s “Topics Search” feature makes that incredibly easy. With about 1,400 total resources amassed in my WORDsearch software library, it’s next to impossible to remember which book, periodical or Bible study talks about a specific subject, and while I can do a normal search for a keyword or phrase, the Topics Search is often the best, most reliable and most comprehensive option. For example, if I do a Topics Search on the word “miracles,” in addition to a list of “hits” on the broader topic, I am also presented with a sizable number of other options, including “Miracles of Christ,” “Healing Miracles,” “Miracles in Acts” and others from which to choose. When I decide on a specific (sub-) topic, I can sort the results by book or location (category), if I want. When I am in a hurry and want to print out some material to read and/or reference away from my computer, nothing beats the convenience of WORDsearch’s Instant Verse Study or IVS, as it’s referred to on the menu bar. It’s a simple, incredibly fast three-step process: 1) I type in the Bible verse or range, 2) Check the boxes next to the Bibles and/or commentaries I want to pull material from and 3) click on the “Copy Study Text to Clipboard” button. Then I simply open up a blank document in Microsoft Word, click paste, click print and I’m good to go. As an example, doing an IVS on just Romans 12:1, selecting six Bible translations and eight of the Bible commentaries I use most often resulted in 17 full pages of relevant, insightful text that took almost more time to print than to create. I can now easily read and highlight my study material as I wait at the pharmacy for a prescription or while I ride the bus to/from work. One of the features I like best is the ability to easily add my own resources to the library, whether it be a “public domain” resource from a site like ccel.org or an online article I find especially interesting. The built-in word processor allows me to either type in information or copy and paste it from MS Word or directly from a web page. (I do the latter almost exclusively.) Two really nice features are activated when I save the document. First, the software indexes each word so if/when I search on, let’s say “salvation,” any of the documents I’ve added will be included in that search. The second nice feature is that any verse references I added to my document will automatically become hyperlinks so that when I hover my mouse over the reference, the actually Bible text will appear in a pop-up box, just as it does in the resources created by WORDsearch themselves. While the WORDsearch web site has a number of resources that seem to be on perpetual sale, (where they just give it a new title depending on the season), their weekly and even daily sales offer some pretty solid resources at some excellent prices. Similar resources for other Bible software platforms, including Logos, (my other software of choice), are almost always more costly, sometimes significantly so. As an example, as I write this, one of my favorite commentary series, the College Press NIV New Testament Commentary sells for $349.95 on the Logos web site, but is only $139.95 on sale on the WORDsearch web site, a significant difference of $210. Even basic items that aren’t on sale, such as the Amplified Bible which is $10 cheaper for WORDsearch than it is for Logos, can often be acquired for less in the WORDsearch format.